When we bought this house, I always assumed that I would use part of the laundry room as a mudroom. But once all of the cabinets, sink, washer and dryer were in place, it became evident that it just wasn’t going to work out that way. Enter sad face. A really sad one. Inspiration struck though, in the form of an old hutch that we inherited. Before I tell you about the transformation of the hutch, take a look at how it started out. Here she is sitting on our screen porch, before the porch makeover. The top half of the hutch is what became my dropzone. The only thing holding the top half to bottom half were two pieces of metal attached to the back. All I had to do was to remove the screws from the metal to get the two pieces apart. The doors were removed, the holes from the hinges were filled in with wood putty and the entire piece was sanded and spray painted. After reinforcing the back with a couple of 1×4 boards, I attached two D rings to hang it from the wall with. This thing will get yanked on a lot as it is where my granddaughters will hang their coats and backpacks along with Pookie and I using it for coats, my pocketbook and the dog leashes. I made sure to insert the screws for the D rings into wall studs. It is further reinforced by using long screws to attach the hooks that are running across the bottom. The screws go all the way through the bottom of the hutch, into the wall. You can find the hooks HERE. 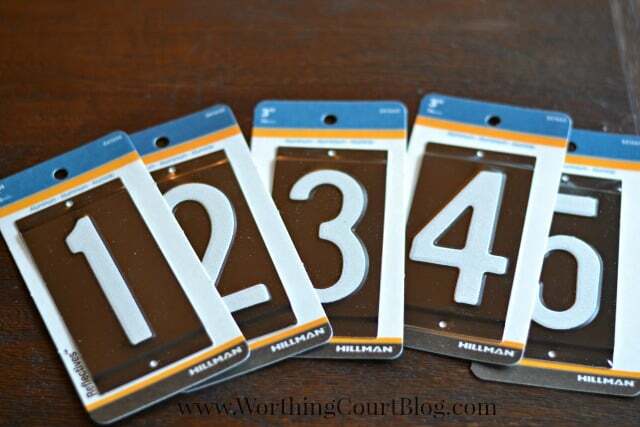 I looked everywhere for some affordable enamel numbers, but none were to be found. I finally ran across these outdoor house numbers at Lowes. At $1.48 each, they are the perfect finishing touch! 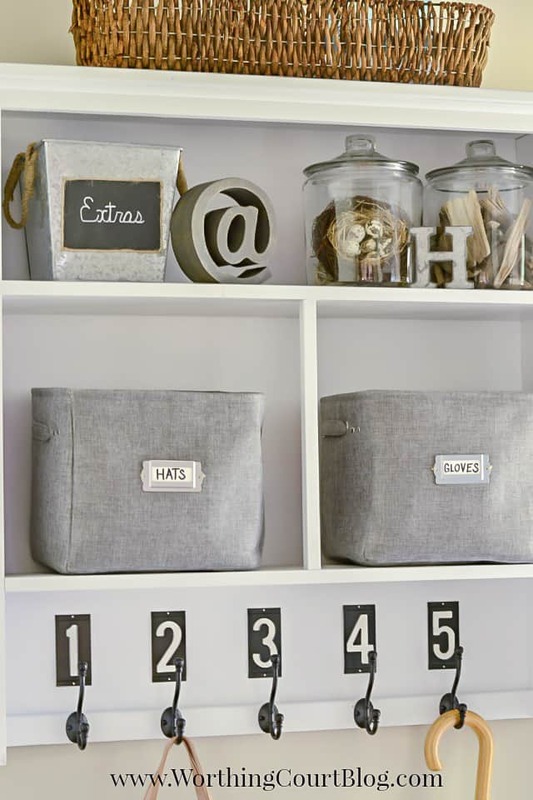 Fabric bins and a galvanized bucket from HomeGoods will work well to hold gloves and hats and other little items this winter. All of the other decorations are from my stash. As a nod to summer, I filled one of the glass canisters with driftwood pieces and placed a faux bird’s nest in the other. Talk about an area that’s hard to photograph! 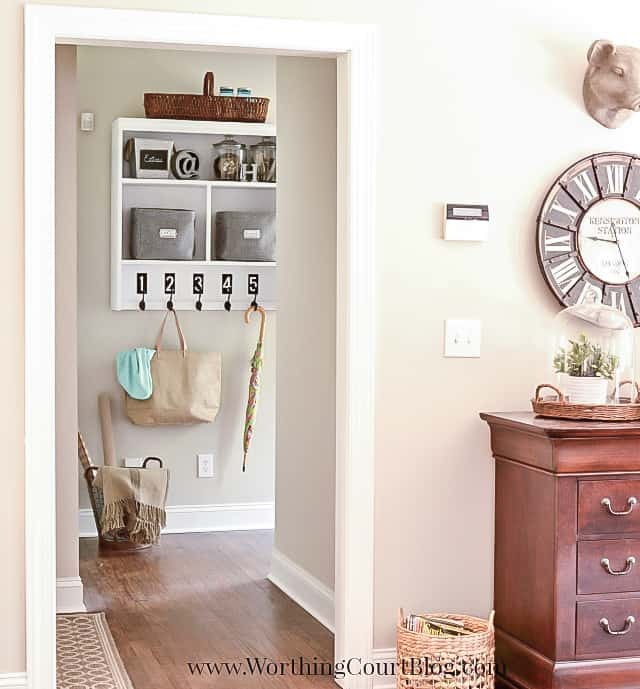 The dropzone is located in an L shaped hallway that is off of the kitchen and runs between the entrance from the garage and the doors to the laundry room, back porch and powder room. Whew! I had to stand on my head, hold my breath and wiggle my nose to get these pictures. Ha! The next two photos were taken from the doorway of the powder room and gives you a good view of the dropzone from the other side. This shot, taken from the kitchen, gives you an idea of just what an awkward area it is. Because of the lighting coming in from the breakfast area windows, the walls in the two spaces appear to be two different colors, but they aren’t. Oh – would you like to see where I used the other half of the buffet? Why, it’s on the back porch! So how about you – do you have any pieces of furniture that you’ve repurposed into something else? What a wonderful idea, so clever! I love it! Wow what a great idea! Would be cute in my daughter’s bathroom to hang robe and such with pretty jars for toiletries and perfume bottles…thanks for the inspiration! That’s a really great idea, Amy! I bet it would work well in a bathroom too for holding towels, etc. LOVE it! and those house numbers are perfect too! Thank you, Anne. I was really tickled when I found them! Love your drop zone Suzy! Don’t you love it when you feel organized! 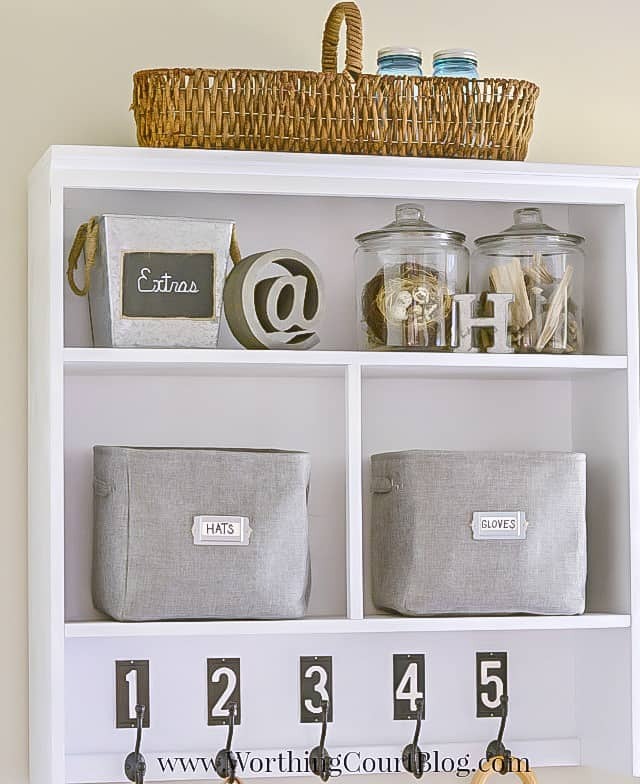 So brilliant how you repurposed this one piece into 2 great storage solutions! What a clever solution – especially breaking up the two pieces! It looks charming and will be so functional. And isn’t it great when you solve something like this and your house starts to feel like your home?! What an awesome idea, I love how you repurposed this into two pretty new pieces! 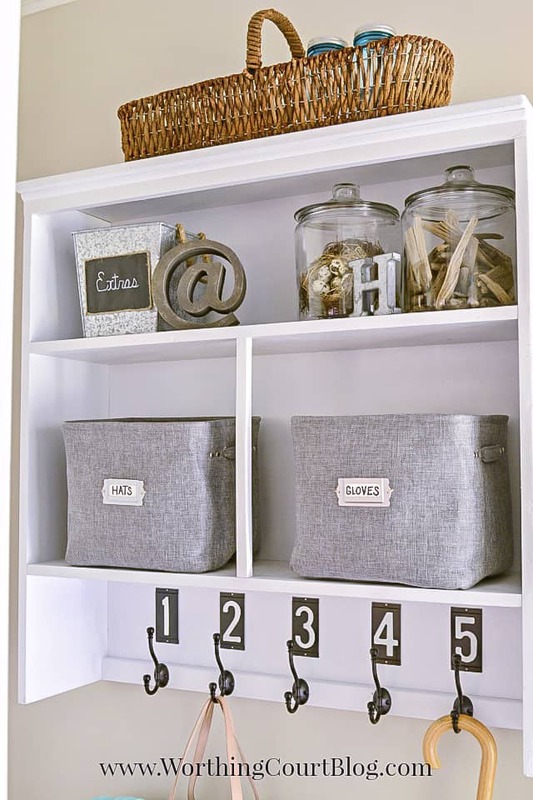 What a great repurpose of the hutch! Very well done! I love it! You have inspired me! I love this! We don’t have a mud room either. Unfortunately, we don’t have the space for something like this either. It still is inspiring and gives me some new ideas for what I can do with our house. Wow, that looks great! I’ll have to remember those house numbers, they look really good on your project! Hi Tania. I’m so glad that you like my project! I was pretty pumped when I discovered those house numbers and for such a great price too. Hi Heather. Glad you like my idea. I’m hoping this will solve the problem of my granddaughters coats and backpacks winding up all over the floor in the family room! We love your repurposed hutch. Gloria chose this as her feature for Snickerdoodle Sunday from Across the Boulevard. Thanks so much for sharing! This is really cool – I love giving old things a new purpose. Thanks for the inspiration. This is so functional and stylish. I love how it looks peeking in from the next room. Thank you so much for the feature, Kathryn! What a wonderful idea! I love that you added the numbers and hooks! This was such a cool idea. 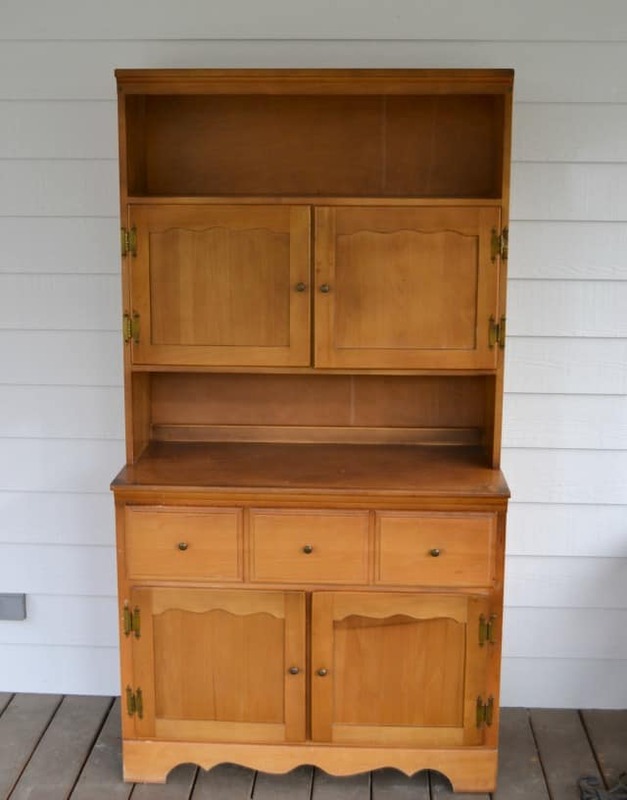 I also love what you did with the bottom part of the hutch. 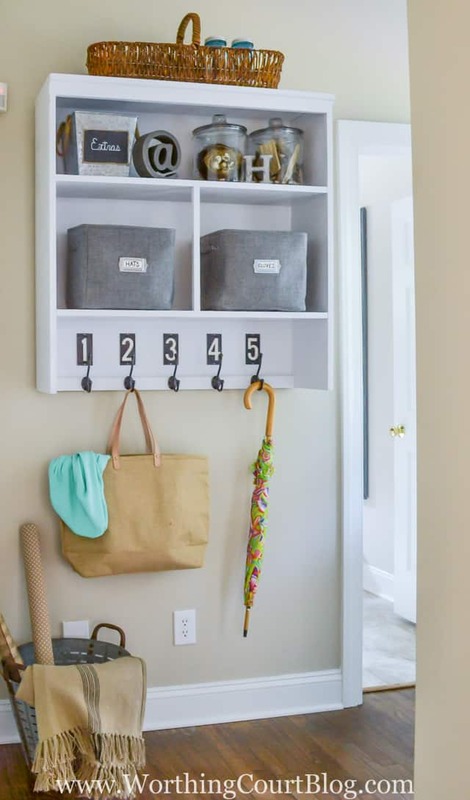 This is an awesome idea for organizing the “mudroom”! Thank you for linking up at “A Little Bird Told Me” Wednesday link party. 🙂 You are featured on Mama’s Happy Hive blog this week! Great transformation! Featuring at the party. Hope to see you again soon. Pinned & shared. This is so clever!! I love how you revamped something old into something so beautiful and useful! Great idea! And it will fit nicely behind an opened door. Can’t wait to pick up hutch top and try this. Thanks for sharing. Suzy, you are so clever. What a great idea and it is so professionally. Done. I hope your beach condo survives the hurricane. Thank you for your sweet thoughts, Doreen. Sadly, it looks like this could be a bad one for a lot of people. The condo has withstood several hurricanes, but you never know. This is one of the best repurposing ideas I have seen!! Love it. Thx for sharing! Love your mudroomette! And such a good idea to reinforce/secure it so you’ll never have to worry about it coming down. Wonderful repurposing of the original piece of furniture- – and great inspiration. I have a tight space when you walk into my condo – I live on the top floor so when you walk in there is not much space. Using this method ~ hanging it on the wall is perfect. I am definitely going to pin this for when we redo our stair case and entry. What a great idea! Charming. While I haven’t re-purposed a piece of furniture, I have painted, installed new knobs and recycled our old kitchen cabinets. We moved them down to the basement 30 years ago when we remodeled our kitchen. We used them for storage. When I finally remodeled our dark dreary basement laundry/craft area, the cabinets got hauled out, cleaned, sanded, painted, new knobs and became our brand new cabinets. I installed new countertops, painted them dutch blue (with my sister’s help) and they look fabulous! They were solid wood so worth saving all those years ago. I’m very proud of how this area turned out. I now have great place to fold laundry, wrap presents (one whole wall is our new wrap center) and do crafts with my grandkids. What a great idea. 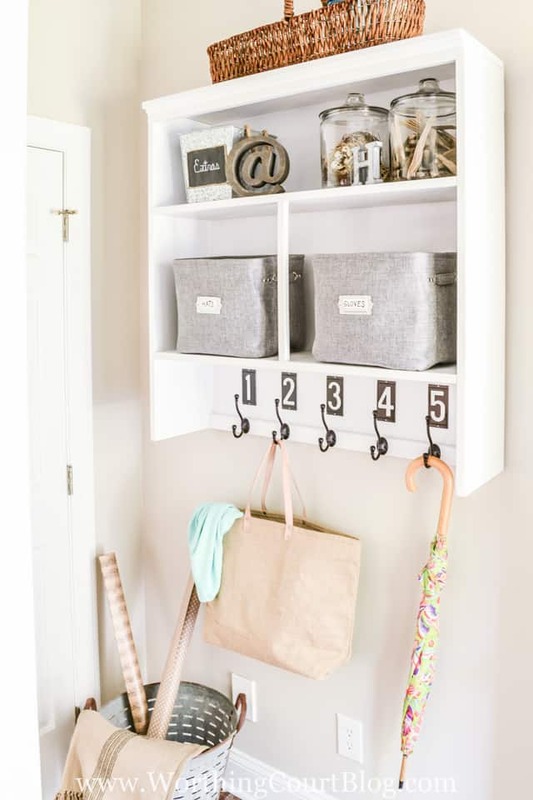 I don’t have a mud room either and this would be a wonderful solution . Thanks for the inspiration. What a great idea-love this! Looks so good. 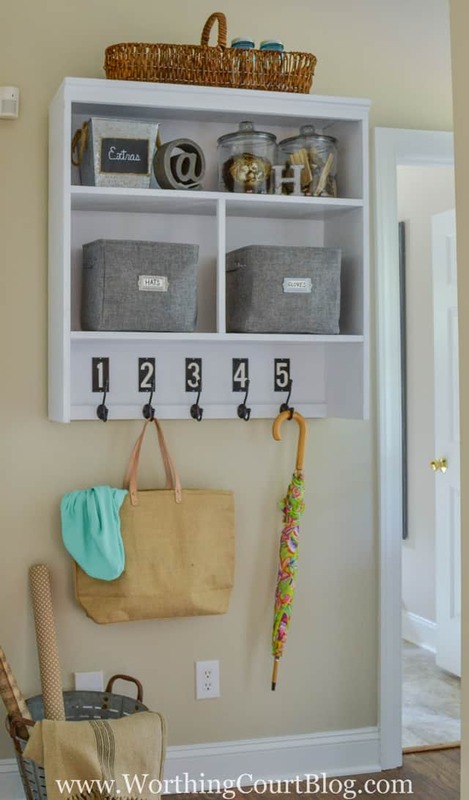 I love the hooks and what a neat idea with the house numbers. I have a small mud room/laundry room too. I like what you did. What do you do with shoes? They are a big issue at my house. I have no floor space. Hi Sandy. Anytime we remove our shoes, they are just lined up along the floor under the dropzone. I don’t have young children living at home, so it isn’t a problem for us. 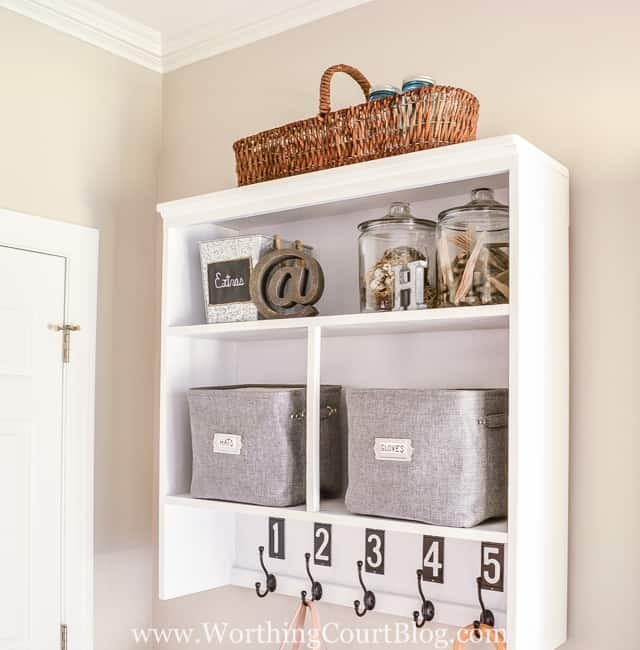 If I did, I guess that I would put a cubby of some sort or a shelf with baskets where each person had an assigned spot to place their shoes. Wow what a great job. No one would have guessed that was one piece turned into two. 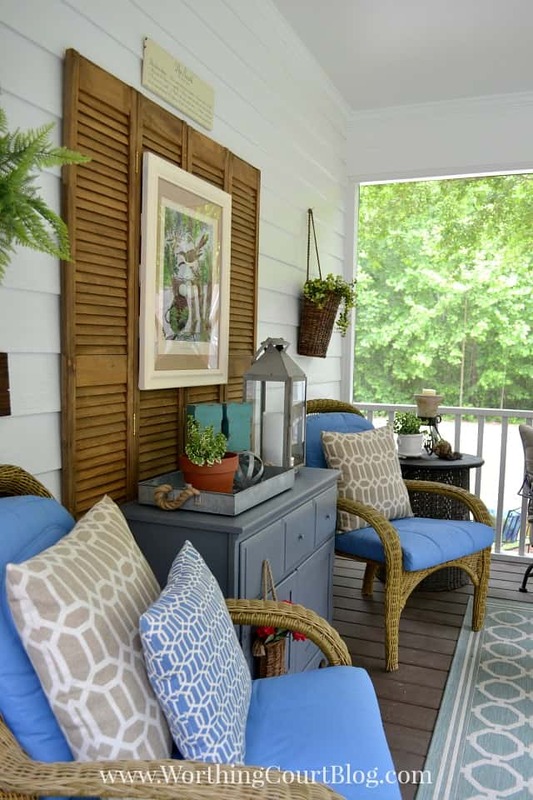 This is one of my favorite makeover projects I have seen. Oh my gosh, I’m SO glad I ran across this post again! I forgot to pin it the first time I saw it and I’ve been searching for an old hutch but couldn’t remember why!! lol This is such a great idea for a tiny laundry room like mine and I have no mud room.